Well here’s something a little different. 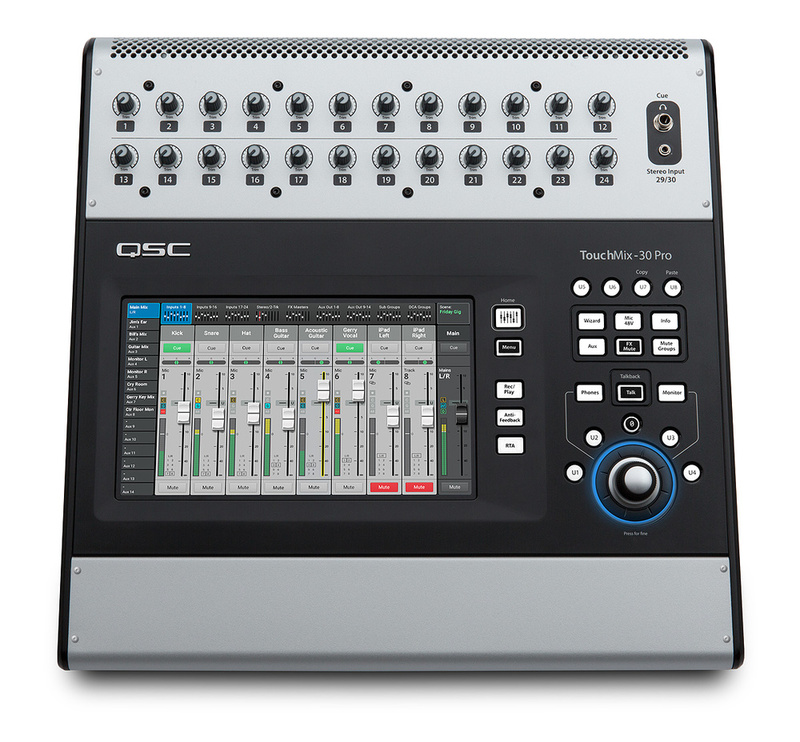 QSC have recently expanded their popular TouchMix range with a new ‘Pro’ model. Joining the established TouchMix-8 and TouchMix-16 is the all-new and much-anticipated TouchMix-30 Pro, and it offers a heck of a lot more than just an increased channel count. One of the most interesting aspects of this mixer is that the design and feature set has been greatly influenced by an experienced professional front-of-house engineer who has come at everything from a “What would make my life easier?” perspective, and, while maybe no two sound engineers would necessarily agree on everything all of the time, this is obviously a thoughtful and above all highly practical approach to compact mixer design. First off, let me reiterate my opening point: the TouchMix-30 Pro isn’t just a bigger version of the (already very successful) TouchMix-8 and 16 versions, and the ‘Pro’ badging is not just there to use up panel space. Secondly, there is not enough space here to describe all of the TouchMix-30 Pro features in detail, but if this kindles your interest then take a look at the QSC web site where you’ll find a whole series of excellent videos and tutorials covering all the main bases — though I suggest you check your credit card balance before you do this as the videos are not only informative but very persuasive! So what exactly is the TouchMix-30 Pro and why is it so interesting? In brief, it’s a compact 32-channel digital mixer with 24 Class-A preamps and 14 aux outputs, all controlled from an integrated large multi-touch display and/or remotely via iOS or Android devices, and with a whole host of clever processing and workflow features, all built in as standard. I have to admit that I haven’t used a TouchMix-8 or a TouchMix-16, so I started straight in on the TouchMix-30 Pro with no preconceived ideas about whether I was going to like it or not. My initial impression of the unit itself was that the whole package is more compact than I was expecting from the description and specification, the footprint being similar to a vinyl record deck or old-fashioned electric typewriter. On power-up the TouchMix-30 Pro takes a little over a minute to run through its start-up routine, during which time I plugged in a few input and output cables to the large, well-spaced panel on the rear surface. There’s a full complement of physical I/O here, and the hardware has a high-quality look and feel (the input XLRs thankfully don’t have those annoying latches and the plugs make a good solid connection). Inputs 21 through 24 are provided with ‘combi’-type connectors that will accommodate TRS plugs or XLRs and there are three sets of paired TRS inputs for channels 25 to 30 (pair 29/30 are also accessed via a stereo mini-jack on the top panel for connecting portable media devices), leaving only channels 31/32, which are for a stereo input via the USB playback port. All 14 aux mixes have individual XLR outputs on the back panel, and there are additional TRS headphone outputs for auxes 11/12 and 13/14 as stereo pairs, which is really useful if you wanted to feed them direct to in-ears, for example. XLR outputs for main L-R and the internal monitor bus complete the analogue connectivity. The ‘pro’ status of this mixer is supported by the avoidance of cheapo space-saving shortcuts here, and as a potential user I do appreciate that all of my ins and outs are available in full balanced glory, right there on the panel. The TouchMix-30 Pro actually has 33 inputs if you count the additional talkback input, which can be routed to front of house if necessary and even has 48V phantom power available. Sticking with the basic mixer functions and moving on to the top surface, the most noticeable thing about the TouchMix-30 Pro is the uncluttered layout and large touchscreen. The top part is taken up with two rows of rotary controls which are input level trims for the 24 analogue preamps. These controls have a nice resistance to them and feel solid enough, although appear not to be fastened direct to the top panel. I had left the mixer in an unheated studio overnight and at first these knobs were very stiff, but this is nothing to worry about and appears to be a property of whatever mechanical damping system they use — they soon softened up a bit when the heating came on, and have an expensive feel too! These controls are critically important when operating the TouchMix-30 Pro — it has a real analogue front end and although the overall gain structure includes digital gain control further down the signal path, you can’t compensate for a too-hot setting on one by tweaking the other. Luckily the metering is very good and there’s also a dedicated wizard function to make sure everything is set optimally. I like the one-knob-per-channel design, which saves any messing about with diving into the channel strip/overview to set up input levels; however it does mean that the analogue trim settings cannot be saved and recalled as part of a stored scene or protected from unauthorised tweaking. 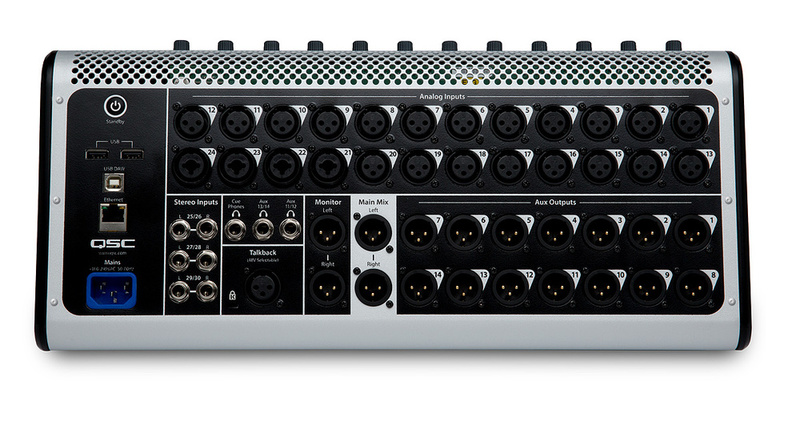 The TouchMix-30 Pro has a generous I/O count, including 24 mic inputs, six line inputs (in three stereo pairs), a talkback input, 14 auxes, plus main stereo out and monitor out, a stereo cue headphone out, and two further headphone outputs mirroring aux pairs 11-12 and 13-14, suitable for running in-ear monitors. Most of the human/machine interface will be transacted using the touchscreen, and the TouchMix-30 Pro has a large and impressive 10-inch multi-touch display set below the input trims and slightly to the operator’s left. Screen size and viewing angles on digital mixers can be frustrating, especially when they are fixed in place (often the wrong place), and I have commented in the past about desks which seem to have been designed for standing use only — I spend most of my shows sitting behind the board and it’s good to see that QSC have addressed this by positioning the screen quite far ‘downstage’, near to the operator, where the angle of view is less critical. They have also included touch calibration settings for both standing and sitting — as with so many features on this product this can only have been designed by someone who knows the game inside out and has put many hours in on the job! Over to the right-hand side are all the other access buttons, including eight that can be user-defined with your favourite shortcuts. The main functions are accessed with dedicated buttons: nice, large, well-lit ones which bear no-nonsense practical labels that tell you exactly what you’re getting into. In fact the only two buttons which have symbols instead of a text label are the ‘home’ button, which takes you directly back to whatever fader bank view you are currently working with, and the zero button which instantly adjusts to unity or — depending on what’s selected — this is a great little feature and one which I made much use of. Adjustments can be made directly on the touchscreen, or by using the large data wheel for more precise control; it’s a two-mode device that allows fine increments to be dialled in when pressed and turned at the same time, I found the gearing to be exactly what was needed no matter what parameter I was changing. Initial setup with the TouchMix-30 Pro is a piece of very quick cake, and having made some connections while the machine was booting up I very quickly had audio running through the desk. The ‘gain wizard’ is simple to use but everything is so clear and well laid-out that anyone with a basic understanding of what a mixer does should have this thing operational in a few minutes. 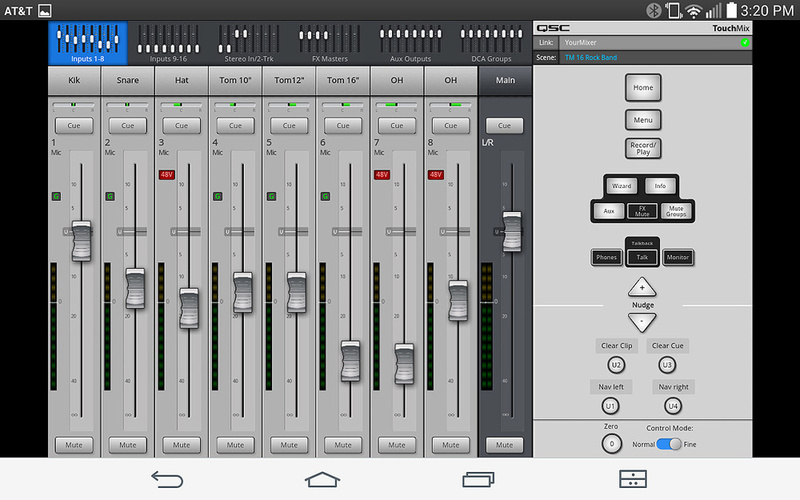 The main mixing window of the app shows eight faders at a time. The default screen view is whatever bank and section of faders is selected along the screen’s top edge, for example input channels 1-8, 9-16 or 17-24, or aux masters, effects masters, groups and DCAs. With eight faders across each screen the display is about the same size as a typical physical fader bank would be, and I really do like the clean, practical appearance and the non-gimmicky way everything is laid out. To change between views you have to select another screen rather than side-swiping to scroll everything along, and the first time a particular view is selected after initial boot-up it takes about a second to switch to the new display — thereafter recalling any screen view is more or less instantaneous as presumably it’s been loaded into memory somewhere for fast recall. 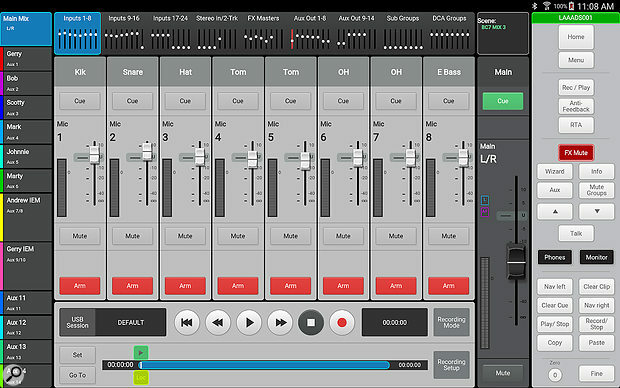 Now, choosing a mixer with no physical faders means that you have to get used to the touchscreen, and I have to say that all of the touch controls respond well and consistently; the only thing I had trouble with was when trying to move more than two faders together — the TouchMix-30 Pro screen is properly multi-touch and you can drive multiple controls at the same time but, realistically, you can’t just grab a bunch of faders and slam them up or down. That’s where planning your use of groups and DCAs comes in. Other than when using the real-time analyser, the left side of the screen always shows the list of output busses (main L-R and 14 auxes), and to the right is always the appropriate master fader and meter; what’s in the main part of the screen is whatever processing you want to work with. I must say that every single screen has been thoughtfully designed for maximum clarity and what you might call ‘obviousness’, meaning that workflow isn’t impeded by trying to figure out what a load of stupid icons mean or how to get back to your basic fader view, and so on. Once you see the layout, mixing the basics is easy and hitting any channel strip takes you into an overview screen that shows everything currently going on with that strip. The detail options from here will access the individual processing engines and sends etc, which are all very easy to work with, and there’s even an option of working the signal processors in simple (essential controls only) or advanced mode, where deeper control is available. Whenever I see the word ‘wizard’ on a screen I generally look for something nearby labelled ‘skip’ or ‘cancel’, but in the case of the TouchMix-30 Pro the setup wizards are well-designed and actually do save time. The other ultra-neat trick up the TouchMix-30 Pro’s sleeve is the inclusion of a whole library of presets which really do work well and assist the workflow; on every input channel, aux, group and effects bus there are recallable presets which have been designed by and collected from real-world live sound applications, and which provide a time-saving head start when configuring a channel from scratch. On any relevant channel overview, if you hit ‘preset’ or use the presets access button (there’s usually more than one way of accessing anything on the TouchMix-30), a three-column table appears. The first column shows sources (bass, drums, frets, vocals etc), and after selecting one the sub-types appear in the next column, and a choice of specific presets in the final column. An example I’m looking at right now is ‘Frets / Acoustic Guitar / Condenser Mic’, which applies an appropriate channel EQ curvature, but in this case doesn’t feel the need to deploy the compressor or gate. Obviously the way any engineer achieves the perfect sound on any source will vary greatly, but I really love this feature and it’s way more useful to me than having a list of individual mic types which I probably don’t own anyway. Full marks and then some. By the way, there’s a little game you can play here to amuse and kill spare time: set up a channel manually to achieve the sound you want for any given source, then recall the appropriate preset on another channel, and compare the two. It’s an absorbing and addictive way of getting more familiar with the TM-30, almost like a built-in training facility. Two things a mixer can never have enough of are input channels and aux outputs, and equipping a 32-input desk with 14 auxiliary outputs is a ratio that works for me. Long gone are the days when having two auxes to cover monitors and outboard effects was guaranteed to make you the coolest guy on the circuit — these days the band are likely to want individual monitor mixes or maybe even stereo in-ears, and because the TouchMix-30 Pro has all the processing bells and whistles built right in you can use all of these for routing back to the performers. The provision of extra TRS outputs for auxes 11-12 and 13-14 and the ability to link all of the busses in pairs just makes life easier all round, and this is the kind of thing which is so valuable for applications where the band requirements vary a lot from gig to gig. Like everything else on the TouchMix-30 Pro, the aux busses are easy to control and the aux overview screen not only provides a wide-angle view of what’s going out to the busses from each input channel or group, but the little slider graphics are active controls which allow actual tweaking right from the overview page. The signal path processing works and sounds great, the EQ and dynamics are predictable and forgiving, and all have as much control over the various parameters as you’re likely to need for a live show. The RTA can be displayed on any channel’s EQ screen and is a useful tool especially for trimming out unused and unwanted parts of the spectrum, and I appreciate the provision of separate dedicated high- and low-cut filters in addition to the shelving options, and the ‘reset’ button which flattens everything. It would be even nicer to have an undo function to step back to the last setting for A/B comparisons, but I found the truly excellent copy and paste facility useful here. There’s also a second RTA which can be used independently on a second remote screen if wanted. 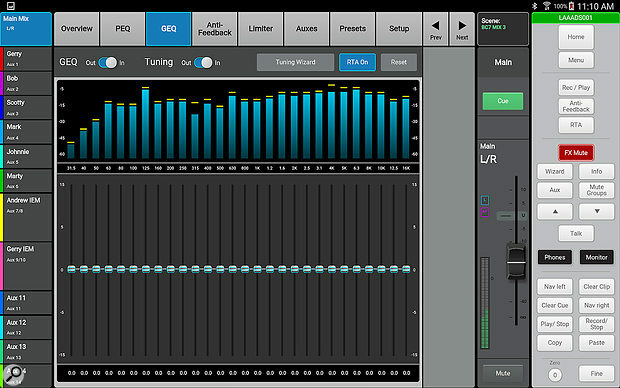 Each output has its own graphic EQ, while an RTA and room-tuning wizard help you tailor your system to the venue. A decent set of onboard effects is something we tend to take for granted these days, and the TouchMix-30 Pro certainly doesn’t disappoint in this department. The TouchMix-30 Pro’s six processors can be assigned and controlled using the effects wizard, or used in a more traditional way by calling them via an input channel or group. 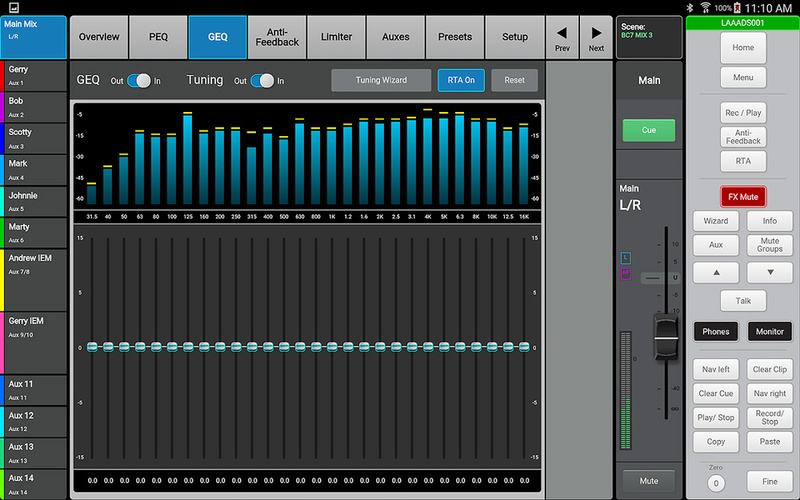 There’s a good range of effects suitable for live sound use, including some very nice factory presets. For example, the ‘lush reverb’ is extremely smooth and sounded lovely on vocal channels; even pushing it way past tasteful didn’t result in anything too unpleasant and I’d love to have this as a starting point on some of my other digital mixers. Also associated with the effects section, although it’s an independent processor, is a pitch corrector whose controls are displayed across the bottom of the effects sends screen for every channel — hopefully not something you’d be needing on too many vocal sources but a great resource to have in the toolkit for both live and studio work. Before I leave the effects section I must mention one more thing: put any engineer behind an unfamiliar digital mixer and the question that usually causes the most head-scratching is, “How do I get the effects into the monitors?” As a great example of how well thought-out the TouchMix-30 Pro is, from any channel overview you just call up the effects screen and you see all six processors with their send levels, two parameter pots and a quick pre/post button (that’s for each of the six processors, mind you). If you tap on one of the effects graphics the next screen not only gives full front-panel control of that effect engine but below it is a whole set of faders labelled ‘FX returns to monitors’, with a little slider and mute button for each of the fourteen aux busses. If that’s not brilliant then I don’t know what is. One processor that never seems to make it into most compact digital mixer designs is a feedback detector and suppressor. The TM-30 not only embraces this technology but implements it very well indeed. The fully controllable 12-band anti-feedback processors are available on all 16 output busses and the detection process is fully automatic, managed by another of the TouchMix’s wizards. There is also a room-tuning wizard that operates on all 16 outputs and requires the connection of a measurement mic to the talkback input. They really have thought of everything here! As you’d expect, the TYY can be hooked into a wireless router and remotely controlled using iOS or Android devices. 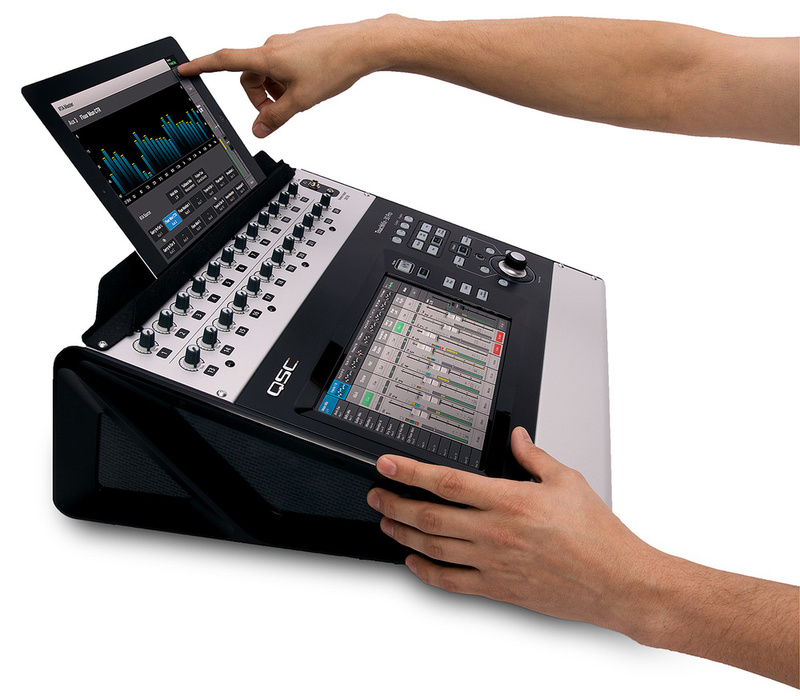 This not only allows the mix guy to wander freely around the venue but also provides access for multiple devices so that performers can control their own foldback, or in theatre shows the sound effects could be under the control of a stageside crew. Another major benefit of using a tablet is that a second screen can be shown — the screen view on the mixer surface and that on the wireless device are not linked, so you could display or manage an additional screenful of functions by having an iPad alongside the mixer. The QSC app accurately reflects the main screen in terms of layout, function and graphics, and even the data wheel is there, represented by arrows. The TouchMix-30 Pro is capable of recording, and playing back, up to 32 channels to/from an attached USB disk. Having all of this impressive processing and audio quality is wonderful for live mixing, but the power of the TouchMix-30 Pro can also be harnessed to make great recordings, and as an audio interface the mixer is capable of forming the basis of a mobile or studio setup. Three recording/playback modes are available: direct-to-drive multitrack, DAW interface and stereo USB stick. Hit the red Rec/Play button and select a mode, and the relevant interface appears on screen. In multitrack USB drive mode you can record (and play back) 32 audio tracks in Broadcast WAV format direct to/from a connected hard drive, without the need for a laptop or any other hardware. If recording into a Mac-based DAW, no drivers are required as the TouchMix-30 Pro supports Core Audio and will therefore work with most applications, and there’s a simple interface for playback of MP3 files from a stick. In every mode, useful instructions appear on screen to help ensure everything goes well. The TouchMix-30 is a well-endowed audio mixer — that’s beyond question — and there’s a lot more to write about than I can describe here. It is a stand-out, different product in so many ways, and I have been endlessly impressed not only by the completeness of its functionality, but also by the way in which every single function is presented, accessed, explained and operated. This is a piece of kit you can’t help but admire for the way that everything has been carefully designed with the end user in mind. Even the integral Help files amount to a full-colour reference manual, right there on the screen at the touch of the ‘info’ button. There’s so much to like about the TouchMix-30 Pro and this is one product I’d recommend getting hands-on with by any means possible; I know that all this is personal preference but this is about as close to something I’d have designed myself as I’ve ever seen — it’s got to be on my shortest of short lists for a board of this type. If QSC ever decide to bring out a future model with at least 16 (preferably 24) physical motorised faders on the surface, and the ability to run a remote stagebox via an Ethernet cable (how about a detachable analogue section? ), I want my name on the first one out of the factory. Maybe two. Few mixers of this type offer all of the TouchMix-30 Pro’s functionality. The closest are probably the Allen & Heath Qu-Pac, the PreSonus StudioLive RML32AI and Behringer X32 Rack, though neither the Behringer nor PreSonus offer direct-to-disk multitrack recording. It does practically everything you’d ever want a compact mixer to do. It does it all really well. Workflow is very well supported by wizards and intuitive displays. Flexible and practical recording options. I’d love to have a digital snake option. I’d also love to have a ‘narrow strips’ option to get 16 channels on a single screen. The TouchMix-30 Pro offers a huge number of features in a compact, sturdy package and, crucially, has been designed to be fast and intuitive to use.